a. CAVING LADDER. Constructed of stainless steel cables and aluminum crossbars. Several ladders can be connected together by the use of two large steel rings on each end of the ladder. b. ASCENDER. 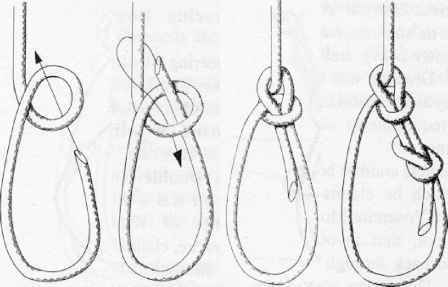 Easily placed and removed from a rope with one hand and allows the rope to run through it in one direction while it grips in the other. A safety device is incorporated to ensure that the cam only releases the rope when the trigger is pressed and out of position. c. RESCUE PULLEY. Has two independent side plates that enable a user to insert the rope onto the wheel without having to thread the rope through. The pulley is large enough to accommodate a 1/2 inch rope and has an eyehole large enough to accommodate two steel locking carabiners. d. HELMETS. Worn to protect the head from falling rocks and from hitting rocks should you fall. Check helmet for cracks or chips and a good chinstrap. The climbing helmet used at MCMWTC is the Joe Brown Light Weight Helmet. (1) Uses. Various devices used as a rappelling or belay device. They should be used with a locking carabiner only. (2) Construction. Made from a heat-dissipating aluminum alloy so device is cool to touch after a fast running rope has passed through it. (User and rope friendly). Care must be taken not to bang or throw these devices onto any hard surface or damage may occur.